When one’s birthday falls in early January, one learns not to expect too much in the way of tropical heat or blazing sunshine. However one can guarantee there will be weather, and plenty of it. Today’s conditions I would describe as typically ‘Cornish’: overcast and blustery with invigorating horizontal rain. Dandy for seagulls and herring, but not a lot else. Despite this, Cornwall’s finer front gardens are already graced with the lavish ruffles and rubicund rosettes of the camellia. The blooms emerge from tidy, dark green bushes in shades of white, lemon yellow, pink and red, some single, some double and some splashed audaciously with a daring combination of ivory and vermillion. A winning combination, as every Geisha knows. Camellias are such improbable flowers for midwinter. They are bold, bright and apparently delicate, but their waxy petals and lacquered green leaves are designed to brave the elements. 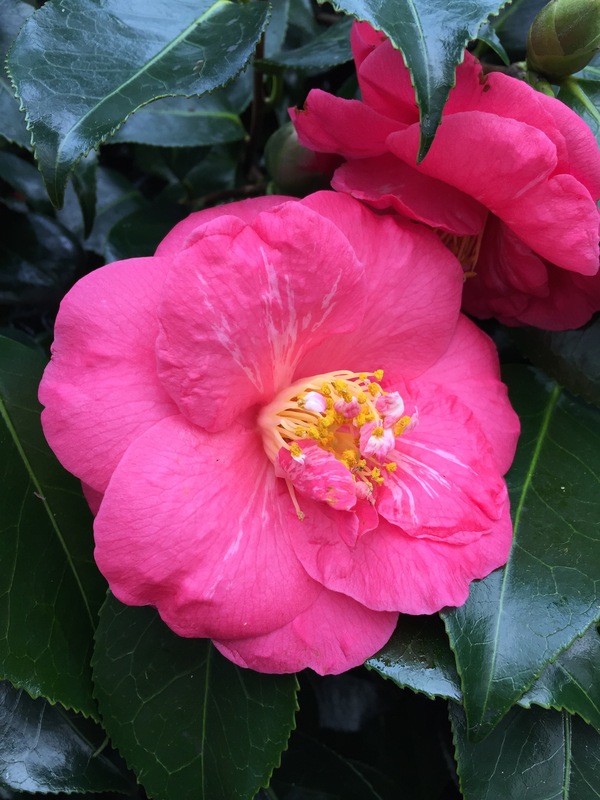 Camellias hail from China, Japan and the Himalayas, where they have been cultivated outdoors for centuries, so it is strange to think that the first plants to arrive in the UK were treated as conservatory plants (for example at Chiswick House). Now, after extensive hybridisation, they are considered hardy in many parts of the country. 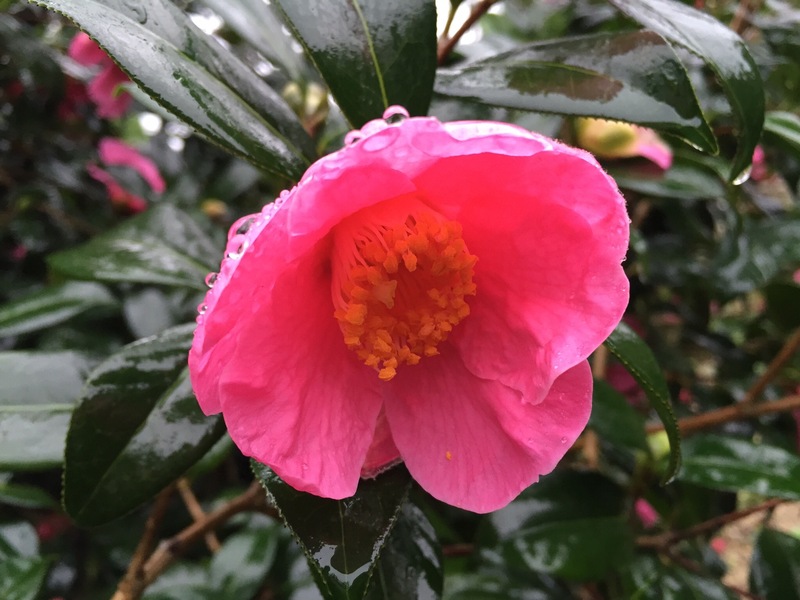 A little shelter from wind, rain and full sun will guarantee unsullied blooms, otherwise the camellias’ only other requirement is an acid soil that’s moist but well drained. Camellias do well in pots as well as planted in the ground. There are several hybrids with a compact habit making them suitable for even the smallest courtyard or balcony. As for me, after a year’s delay I have decided that we must have camellias, replacing two architectural but dull pseudopanax on either side of our French windows. They’ll be a birthday present to myself, but which variety to choose? If you have any tried and tested favourites, I’d love to know. Aren’t they beautiful? They seem to be especially early this year. Happy Birthday. As a fellow early January Capricorn I know just what you mean. For my 50th we went all the way to South Africa in an attempt to avoid the inevitable lousy weather. It rained. Biblically. Happy Birthday Dan. I adore camellias and in my last garden I grew over 30 varieties. One of my favourites was Camellia x williamsii Jury’s Yellow, but it is so difficult to choose just one. My mum’s birthday falls in January, I think I will send her the flowers in your post 😉 Happy Birthday! My birthday is early February, and after 33 bitterly cold birthdays I can thoroughly recommend a move to the southern hemisphere. 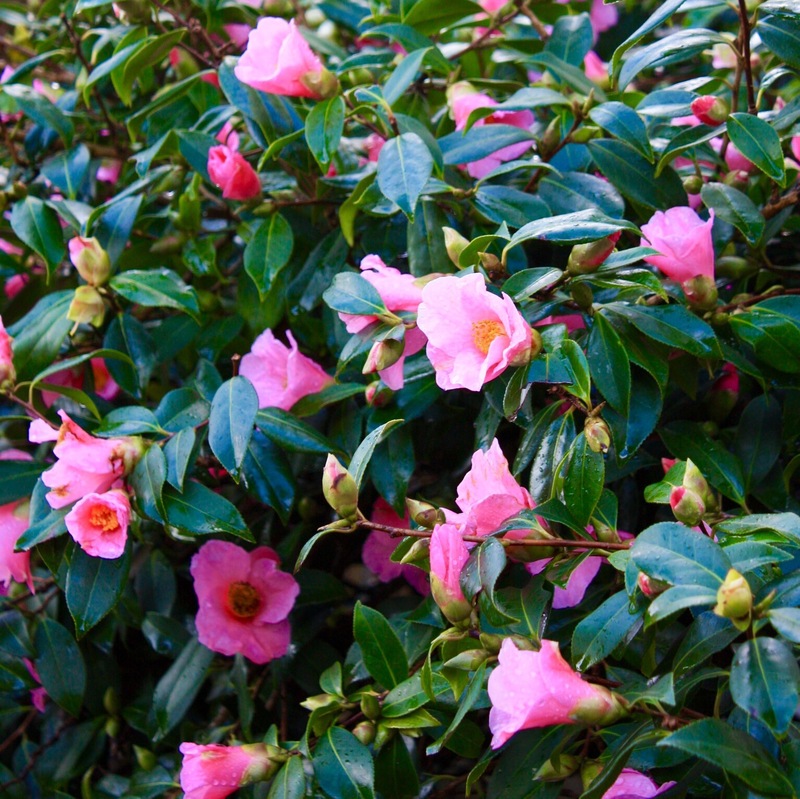 If you pick the right spot you can grow every Camellia under the sun and so much more! I hope you enjoyed your day, nevertheless. Thank you! I agree, there is nothing more beautiful than a warm summer’s day in England. Your comment on May made me smile. Returning by bus from a pantomime in Richmond one cold, wet, windy January night, I told my then boyfriend ‘that’s it, I am not going out again until May’! He still reminds me of it today. Time for a visit to Burncoose methinks. Their selection is second to none. Me, I like the sasquehanas, often in flower before Christmas…woth wonderful dark foliage and often white and blushed single blooms. Enough to britten any winter day. But shhhh! January is the best month in Cornwall – all those camellias and blessedly quiet roads. Sorry about the typos! Predictive text is a pain….